While Nikon Corporation was introducing its first single lens reflex film camera in 1959, Nikon engineers were already working 3 years on the production of an 8mm. movie camera. At the end that camera never entered the market. The prototype of that all metal ´high performance´ movie camera had a lens turret with three Cine-Nikkors, a fix-focus 1.8/6.5mm., a 1.8/13mm. and a 1.8/3.8mm. The camera, a double-8 movie camera, used cassettes with a 16mm. film, which had to be turned/reversed halfway the running time (after approx. 7.5 meter film) in order to be able to film on both tracks. It had a mechanical spring motor with speeds of 16-64 frames per second. It is said that due to high production costs and problems with the cassettes the project was stopped. It is a pity that this camera never came on the market, although other producers, like e.g. 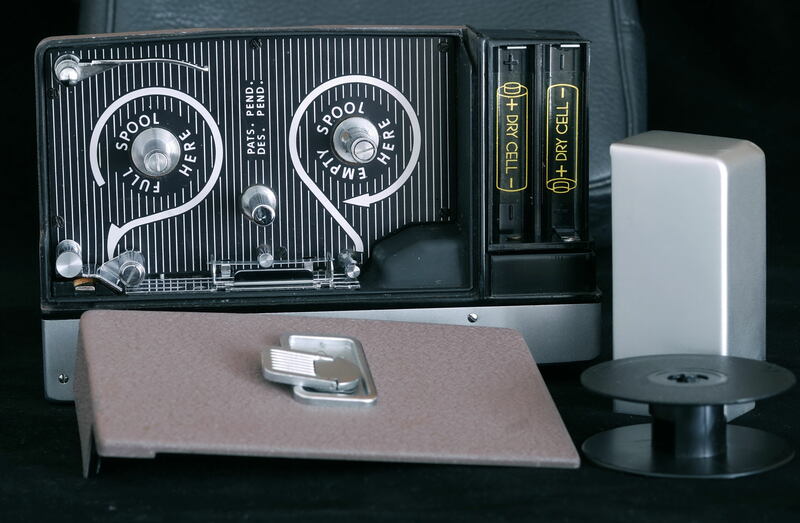 ARCO, Bolex, Bell & Howell and Yashica had a lot of success with similar models. 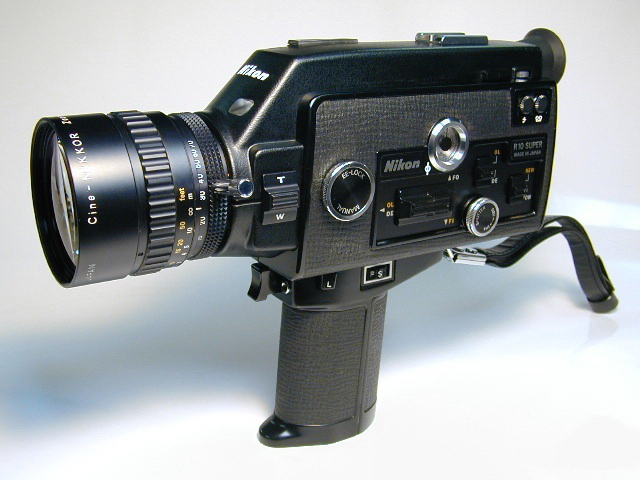 The first movie cameras are named Nikkorex and have some resemblance to the Sankyo Movimat and CM-series. The Nikkorex movie projector is a Sankyo clone as well. 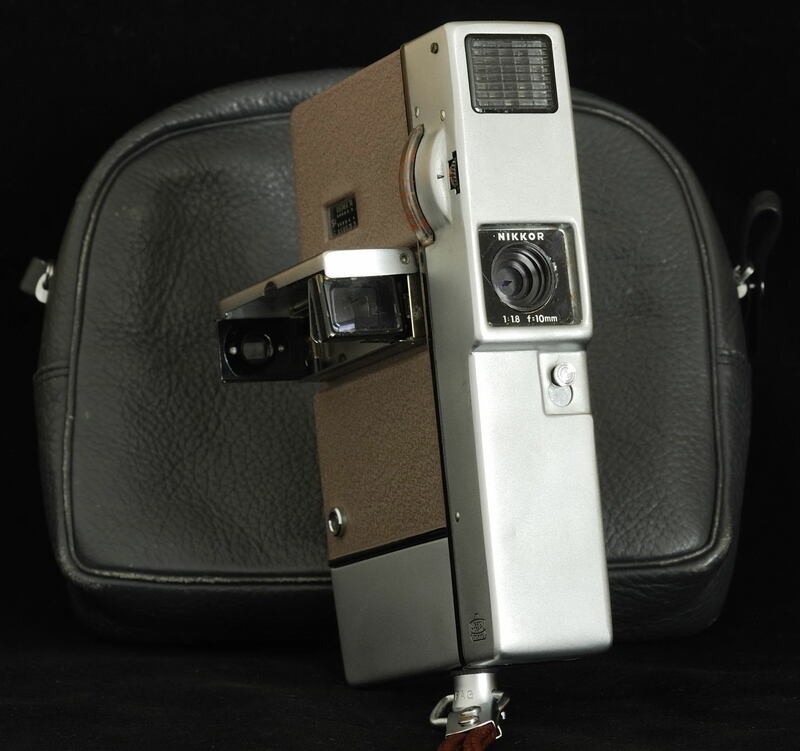 Late 1959 an 8mm-movie camera was introduced, which became available in September 1960. Together with the introduction of the first Nikkorex 35 single reflex film camera (Nikon´s first film camera with an interlens shutter) the Nikkorex 8 movie camera with one lens - Cine-Nikkor 1.8/10mm. (with a strange 4-blades aperture) - saw the light. It has an electric motor and full automatic exposure. That built-in exposure meter has an incredible range of ASA/ISO 5 - 100 !! Nikon Corporation explained the introduction of this very slim camera with ´everybody should be able to make an excellent film by pressing just one button´. The camera became a success: production reached a monthly 3,000 cameras by the end of 1960. 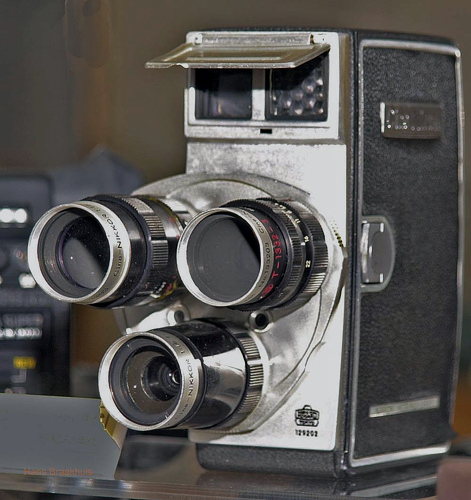 The folding viewfinder was replaced by a reflex viewfinder in 1963 in the new Nikkorex 8F. Above the film compartment and the battery (4xAA) compartment with their cover: simple loading. 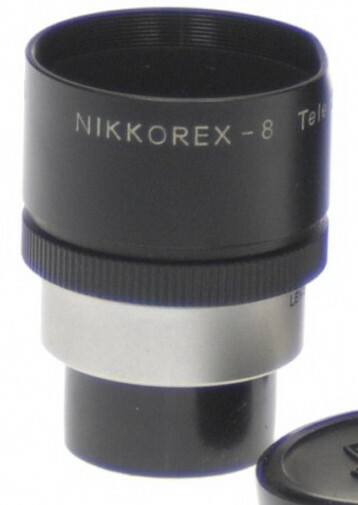 Some close-up lenses were available, among them a tele-converter lens (see above), doubling the focal length of the standard lens and even a zoom lens. 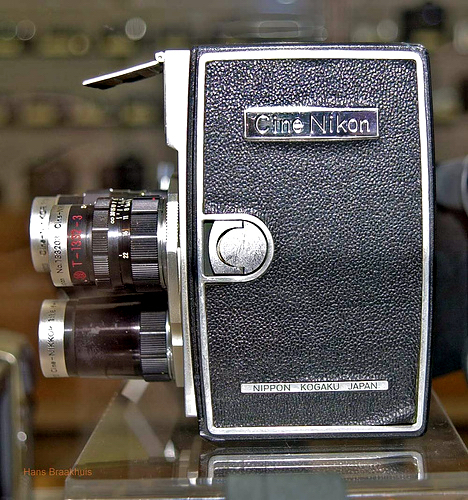 In 1963 a larger movie camera, the Nikon-Zoom8 with a Cine-Nikkor 1.8/8-32mm. 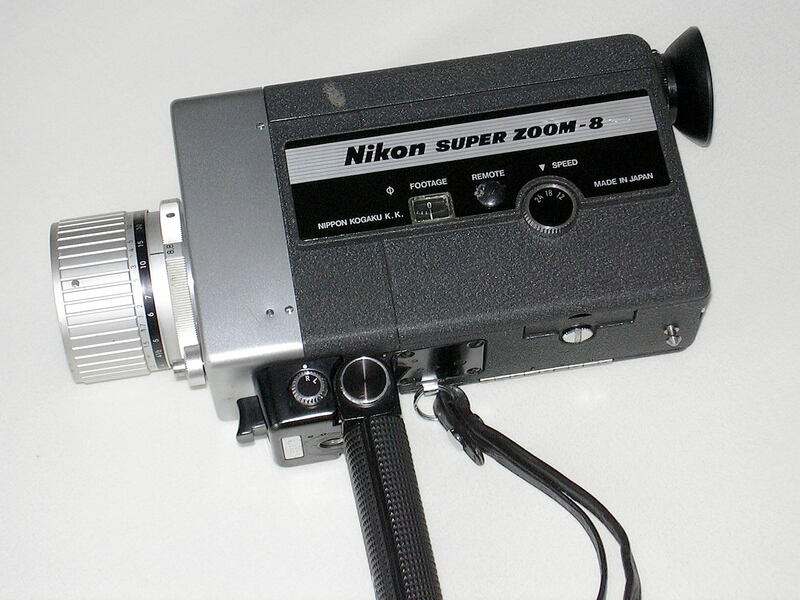 was introduced, too; followed by the Nikon Super-Zoom8 movie camera in 1965 with a Cine-Zoom-Nikkor 1.8/8.8-45mm. The latter camera is interesting for collectors as it exists with the name ´Nikkor´ as well, due to an agreement Nikon made with the German competitor and fellow camera producer Zeiss-Ikon for selling Nikon products in Europe. Nikon Zoom-8 with Cine-Nikkor 1.8/8.8-32 mm. Japan´s Fuji Photo Film Co. and American Eastman Kodak Co. developed an 8mm. movie film, making it possible to produce a smaller camera. The 8mm. had two formats, the single-8 and the super-8. A single-8-film has its perforation at both sides, the super-8-film just at one side, leading to a little larger frame/image. Making movies became a hit in the 1970´s. Economy in the western world was improving, people were able to take and go on holiday and many manufacturers sold thousands of movie cameras per month. Nikon had to face a harsh competition: the Nikon 8XSuper Zoom in 1969 was a sophisticated movie camera with a zoom range of 7.5 - 60 mm. Fuji and Kodak were quarreling frequently about their single- and super-8 formats. Kodak developed an 8-mm cassette with a double take-up spool or reel, making it not necessary to turn/reverse the cassette halfway the film. It was a Nikon engineer that invented the possibility to make overlaps with a film by pushing a part of the film in between the space of the reels. This so called R-invention was patented worldwide. 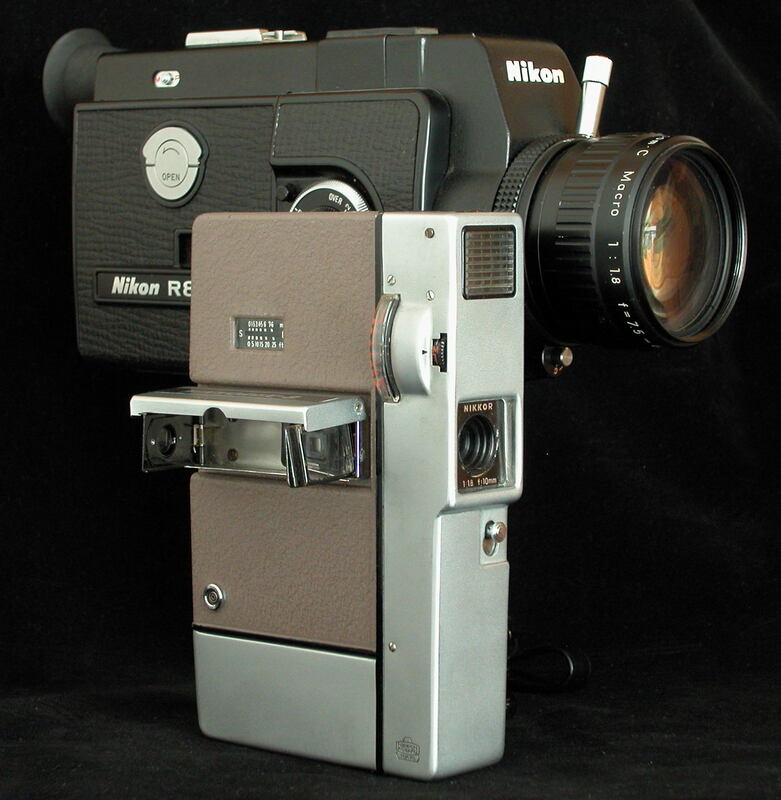 Short after this invention - in 1973 - Nikon put two very nice and even more sophisticated movie cameras on the market: the Nikon R8 Super Zoom and the Nikon R10 Super Zoom. Both cameras weren´t cheap (resp. 1100 Euro and 1450 Euro), but are packed with features, which other cameras didn´t had, like fade out/in, reflex viewfinder, external lamp connector, electric zoom and transport motor and a beautiful Zoom-Nikkor lens. The R8 has a fast Cine-Zoom-Nikkor 1.8/7.5-60mm., the R10 a Cine-Zoom-Nikkor 1.4/7-70mm. Funny enough the more expensive R10 was a better seller than the R8. Both cameras are rare nowadays on the secondhand market, but if you find one, buy it. Look at the battery compartments and the film compartment for leaks and dirt. 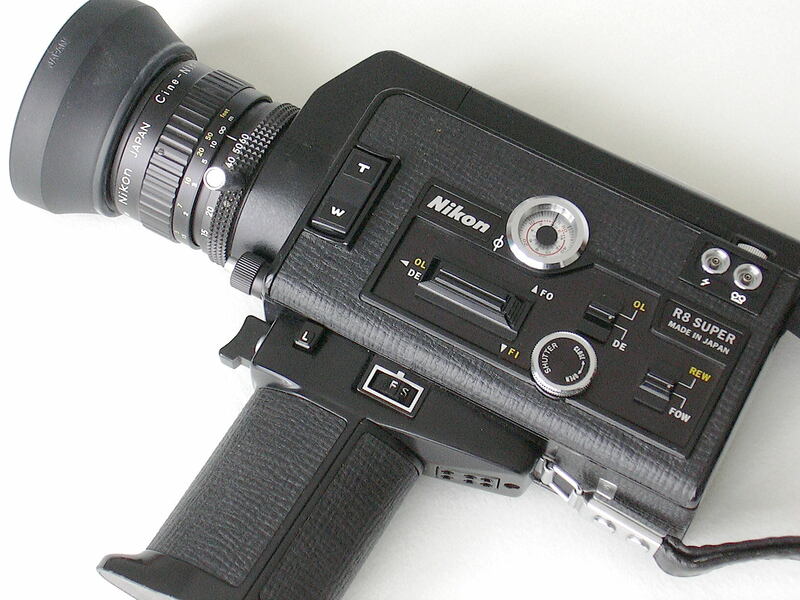 In 1979 Nikon stepped out of the movie camera business due to the arrival of video. Nikon played just a minor role on the new video market with some cameras, developed together with fellow camera makers, like Sony. Movie cameras aren´t produced anymore by Nikon, although it still produces lenses for professional movie and TV cameras. For information on Nikon video cameras have a look here.